The oil storage caverns are assumed to operate within 0.5 to 2.5 bar pressure in the gas phase (-0.5 to +1.5 barg). The caverns will not vent hydrocarbon gas to the atmosphere (or to a flare), unless in an emergency situation. The various caverns may communicate in the gas phase for better utilization of the gas volume, however, such communication should go via the vent pipe system above ground, thus allowing separation in situations when the caverns will be operated with different pressure (e.g. when pulling pumps). The cavern roofs are located at elevation 35 m below sea level, and this, in combination with a ground water infiltration system, will ensure that no hydrocarbons escape from the caverns. The ground water infiltration system may be established from tunnels (water curtain galleries) approximately 15 m above the cavern roofs, in combination with a system of boreholes that covers the entire cavern area. The caverns will have submersible pumps in pump pits. The location of the pump pits may be favorably located near the end of the caverns due to circulation during import/export (import in one end, export in the other), but this must also be considered in connection with the location of cavern tops above ground as well as the optimal orientation and location of caverns which in turn are strongly dependent on the geological conditions. The caverns are planned with a fixed water bed and a water bed weir. In a crude oil cavern, the water bed weir will control the possible dropping of wax lumps into the pump pit. 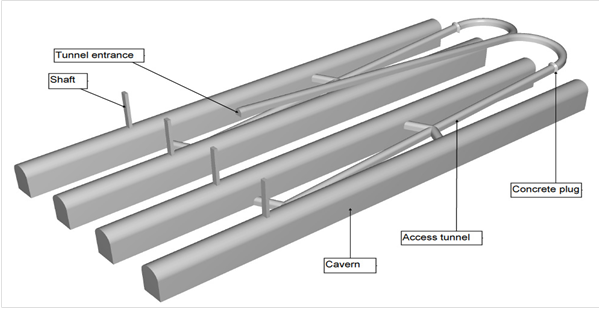 The principle layout for the caverns are based on four 450 m long caverns , located in parallel, in pairs associated with an access tunnel system starting at site prep level, leading down to the bottom of the caverns. The length of the access tunnel (as illustrated) is approx. 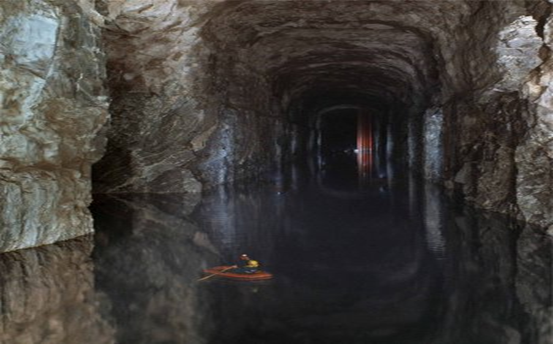 600 m.
The lower part of the access tunnel (below the concrete plugs) is utilized as storage volume, connected to the oil caverns. The water curtain galleries are not shown in the figure. The width of the caverns is currently set to 20 meters and the height is set to 33 meters. The caverns are given a circular shaped roof and straight vertical walls. For poor rock conditions, the walls may be curved, providing the cavern cross section with an oval like shape. Such shape is, however, normally more costly and time consuming to excavate. Based on a required oil storage volume of 900.000 cbm, the total storage volume to be excavated, including an additional 25% gas phase, will be 1.125.000 cbm. Water beds/sedimentation beds and pump pits will add approx. 20.000 cbm to this volume. The length and number of caverns may be subject to optimization based on geological conditions, access tunnel design and location of pump pits/cavern tops.